Hubs and I are in complete agreement: Bug is our whole world. (To which he once replied, “Hey! I am not a planet!”) His gravitational pull is inevitable, in a way only your children can be, and we’re stuck for the long haul. So what happens when your world starts to fall apart, in a scary, vomit-y, dizzying, all-night-in-the-ER kind of way? After a perfectly normal Friday (Bug barely had a slight cough), we tucked Bug in bed and settled in for the night. After about half an hour of playing and reading in bed, he coughed and vomited a little bit. He’s done that before, where his cough was just a little too aggressive, and ends up spitting up a bit. So I took him to the bathroom to get him cleaned up, and noticed he wobbled a little walking down the hallway. When we got back to his room, he announced, “Mom, I’m really dizzy.” It was almost surreal, hearing a four-year-old say he was dizzy. So Hubs and I got him dressed to go to the ER. While we were dressing him, he started to fade away. His body was still conscious, but began answering every other question and losing some responsiveness. By the time we got him in the car, he seemed to have fought back a little, talking about Santa and his reindeer, but on the drive to the ER, his little mind left again. While I sat next to him quizzing him on numbers, Santa, and the like, it was almost like I was talking to an autistic child, answering only a few questions, and sometimes not the way Bug would have answered. A few minutes before we got to the ER, he was gone completely, and I had a Bug-doll in my arms, dead weight. The nurses took us straight back, undressed him, and still, he was completely unresponsive. It was as if his mind checked out, and he didn’t come back to us until the nurses stuck an IV in his arm. His ear-piercing scream never sounded so sweet. He was still out of it a little, kind of in a daze, and couldn’t really spot us. The doctor asked him to find Mom and Dad, and he’d look around, trying to find our voices. It was disconcerting to say the least, watching him twist all around trying to find us, while Hubs and I were hovering just inches from him. They did every kind of test possible: an EKG, X-Rays, CT scan, blood work…after everything came back completely normal, they decided to admit us to the hospital to monitor Bug while he slept. Finally, at about 3:00 in the morning, we were in a hospital room, and Bug could sleep. The next morning, Bug woke up completely normal. He was hungry, chatty, and excited about Santa. I won’t lie, I wept a little. After breakfast (hospital food, yum), Bug visited with a neurologist, who told us she thinks he had an “absence” seizure, where, essentially, his brain is having a seizure, but his body isn’t convulsing or even moving. Someone who suffers from “absence” seizures basically checks out for a few seconds at a time. He could be in the middle of a sentence, check out, then come back, picking up right where he left off. 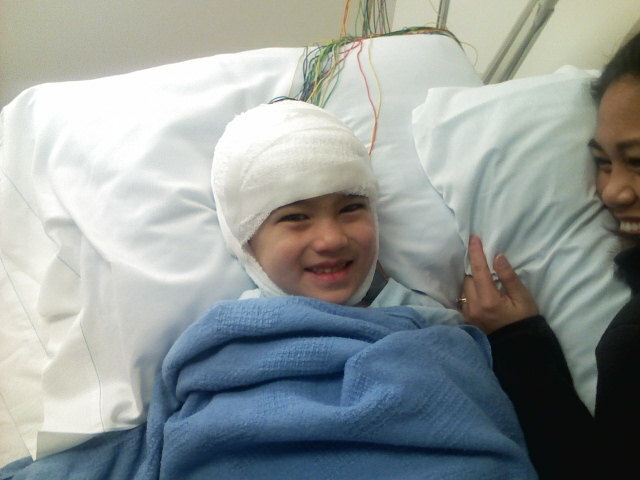 The neurologist ordered an EEG, which, again, came back as normal. So the good news is everything, every test, is well within normal limits. But the bad news is, what the hell happened? We had a follow-up visit with Bug’s pediatrician yesterday, who isn’t quite as comfortable as dismissing it as a fluke, perhaps a perfect storm of symptoms that caused his little body to go into a fit. The ER doctors found a slight heart murmur on Bug’s EKG (not a huge deal, almost half of America has one, yours truly included), which his pediatrician is not so much concerned about, but would like to explore a little further. So come January, Bug has two appointments with a cardiologist to find out just how innocent that heart murmur is, and if there is anything heart-related that could have caused his episode. If that one comes up negative, his doctor is going to order a more formal EEG, one that lasts about an hour with the patient being asleep for at least part of the test. In the meantime, Bug has his doctor’s blessing to resume all regular activities…including basketball. And in the meantime, we’re stuck wondering…could it be his brain, or his heart?